We recently surveyed 3,900 Ohio PreK – 12 teachers (and ProgressBook users) about their approach to digital learning and use of Learning Management Systems (LMS) in their classrooms. Our goal was to gather insight about what teachers currently use, want, or need from tools designed to facilitate coursework, enhance teaching, and improve learning outcomes. To kick off the survey, we wanted to get a feel for how many classrooms are supporting 1:1 computing initiatives (i.e. tablets or laptops for each student). A little more than half of all teachers say their students have access to their own computing devices. Broken down by grade level, 1:1 programs are highest at the high school level (59%), followed by middle school (53%), elementary (45%), and PreK –K (30%). Secondly, we wanted to know how many teachers utilize an LMS, which typically serves as the learning platform for 1:1 initiatives and blended learning programs. Considering the fact that less than 25% of our nation’s public schools offered any type of blended or online learning classes in 2007-08, we were surprised to learn that nearly 3 out of 5 teachers said they currently use this technology in their classroom. Thirdly, we wanted to know if teachers were managing their LMS platform on their own, or if the solution is approved and managed by the school district. With well over two-thirds of teachers identifying their LMS as “district approved,” we can assume that school systems are striving to improve efficiency and collaboration by supporting one district-wide solution. How Do Teachers Use Their LMS? At 67%, “Homework assignments” ranked highest on the list, followed closely by “online quizzes/exams” (62.6%), “quick formative assessments” (60.9%), and “create my own content” (54%). Less than half of teachers reported using their LMS for collaborating or sharing content with other teachers (47.8%), collaborating with students via messaging or discussion forums (42.8%), or analyzing student performance data (42.5%). What do Teachers Like Most about their LMS? “I can create assignments that my students can access, complete and turn in online, and that my students can collaborate with each other. What Do Teachers Like Least About Their LMS? 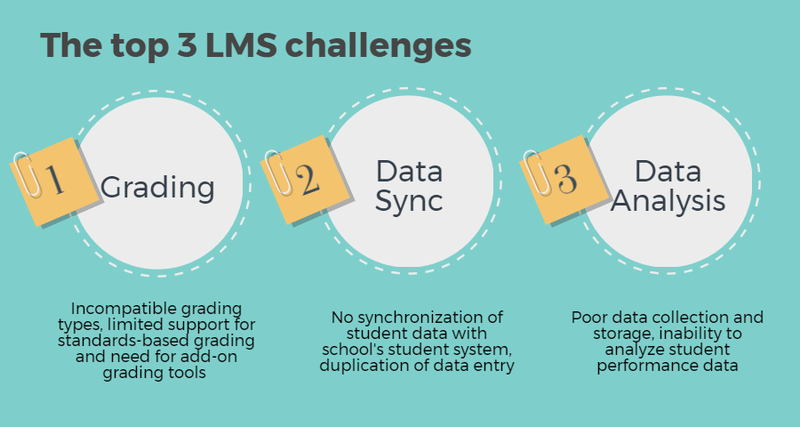 Teachers mentioned grading and data issues—collection, synchronization, and analysis— the most as challenges of using an LMS. “I dislike that my LMS only allows full points (whole numbers) and not decimals or fractions in grades. 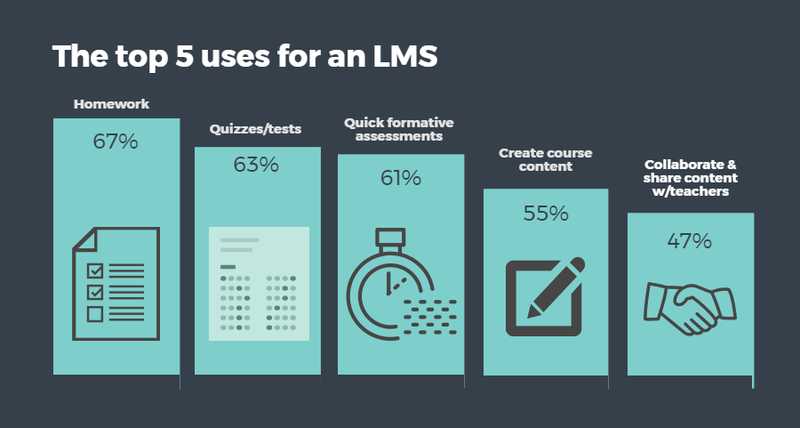 Among the teachers who don’t currently use or have access to an LMS (42% of respondents), we wanted to understand the type of features they would consider Must-Have vs. Wish List or Not Important. 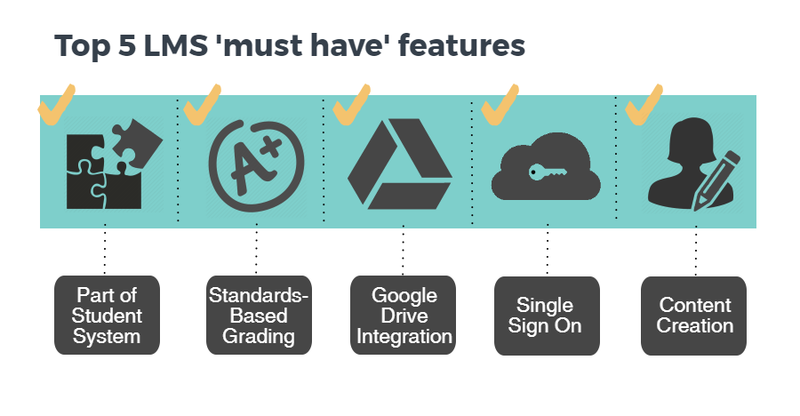 The features that received the highest must-have votes—automated grading and grading integration (62.8%), standards-based grading alignment (62.5%), Google Drive/apps integration (61.3%), single-sign-on to all classroom applications (60%), and auto scoring/Instant feedback for students (59.6%)—are capabilities that offer important benefits for both teachers and students. Ranked closely behind were such features as the ability to create course content (57.1%), student/class data analytics (56%), content sharing/teacher collaboration (55.5%), and the ability to import free or paid course content (47.5%). Surprisingly, the feature that ranked lowest as a must-have (24.8%) and highest as not important (28.55%) was student messaging and discussion capabilities. So, what’s the bottom line? Overall, we discovered that Ohio teachers are overwhelmingly on board with digital learning environments and the technologies that support new educational approaches. Whether they support blended learning or 1:1 programs in their classrooms, or currently use an LMS platform, respondents were excited about the possibilities of technology-facilitated learning.In the end, we also found that our own LMS—ProgressBook VirtualClassroom—offers all of the most-liked and most-wanted LMS features and solves issues associated with grading, data synchronization, and analysis. Want more information? Visit our website or sign up for a free 60-Day Kickstart of VirtualClassroom to learn more.We would like to thank everyone who participated in our teacher survey. We were delighted with not only the number of respondents but also with the volume and quality of extended responses. Clearly, ProgressBook teachers are eager to share their experiences and attitudes on these important topics, and we greatly appreciate the feedback. Let’s keep the conversation going!